For twelve-year-old Loochie, the horror is that her best friend Sunny is dying from cancer, and no matter what she does, she is helpless to save her. I liked the beginning of this novella — all Loochie wants for her twelfth birthday is to celebrate with Sunny. Unfortunately Sunny is undergoing treatment and so is unable to attend the party Loochie’s mom throws for her. I like LaValle’s delicacy in depicting the mother/daughter relationship — Loochie’s unwillingness to believe that Sunny’s condition is irreversible, contrasted with her mother’s gentle suggestion that she make friends with other girls (somewhat insensitive, but still well-intentioned). I’m a sap for stories about people dealing with loss, as you can see in my highly emotional review of A Monster Calls), and LaValle’s beginning made me think this novella would be emotional as well. Unfortunately, it falls apart for me once the story really gets going. Lucretia and the Kroons is about Sunny going missing, and Loochie having to travel to the mysterious apartment 6D to rescue her. 6D is ruled by the Kroons, creatures who have reportedly used crack (according to Loochie’s older brother) and have parts of their faces missing. The Kroons appear mostly as zombie creatures who, for some unknown (at least for most of the novella) reason, keep kids in their lair forever, and Loochie believes they now have Sunny. There are several ways this story could have gone, and I was hoping for a masterfully crafted horror tale that also works as a metaphor for Loochie’s fear at losing Sunny. Instead, I thought the story was a mess. It was confusing, unable to work either as a full on horror piece or a realistic story. As Loochie explores 6D, part of her wonders how a park or any of the other locations and structures she encounters could exist inside an apartment unit. Her confusion is understandable; unfortunately, LaValle never develops his world fully enough for the reader to grasp it either. I eventually just had to ignore all the references to 6D being an apartment unit (the entire “real”/realistic world) just to make sense of the story’s geography. Loochie’s search for Sunny and her attempts to outrun the Kroons also felt very disjointed. I can understand Loochie not having a plan on how to locate Sunny, but there didn’t seem to be a logical sequence either in her search. I could follow the thread up until she entered 6D, then the events just seemed haphazard. As well, because we didn’t really understand anything about the Kroons, beyond the fact that they looked like zombies, there was never a sense of real menace about them. It is possible to make a frightening monster without much detail (again, see A Monster Calls), and I can understand Loochie not knowing exactly why the Kroons are scary. However, there just isn’t enough about them for the reader to grasp, which makes this reader, at least, not care. The story progresses as expected, and once we get touches of the real world, particularly about Sunny’s condition, the story strikes some minor emotional notes. But it’s difficult to lose oneself in the deeper layers of the story when the basic framework itself is so unclear. The last couple of pages, giving a glimpse into Loochie’s life at thirteen, make sense only to remind us that this novella is a prequel (or companion piece, as it’s called in Goodreads) to LaValle’s novel The Devil in Silver. Perhaps reading that one will give me a better appreciation of this novella. 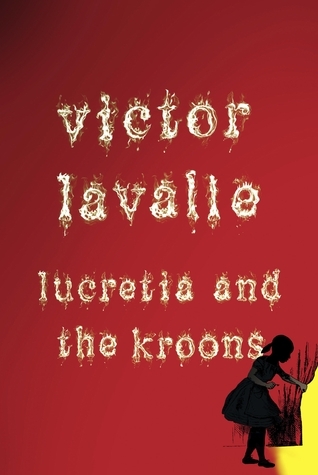 As a stand-alone, Lucretia and the Kroons may have some highlights, but the central action was just too problematic. Thank you to Random House Publishing Group for sending me the e-gallery of this book via Net Galley in exchange for an honest review. This entry was posted in Book Reviews and tagged 50BookPledge2012, ARC, Fiction, Horror, Random House by Jaclyn. Bookmark the permalink.